- Note: Purchase of Support is required. VPP incentives available to VMware clients. The NSX virtualization platform is helping hundreds of customers realize the full potential of a Software-Defined Data Center. 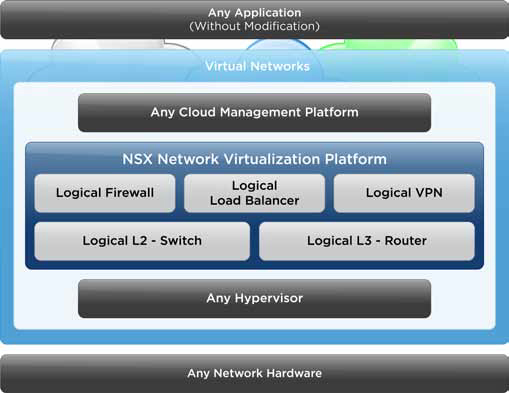 NSX delivers for networking the capabilities VMware already provides for compute and storage. Create, save, delete and restore virtual networks on demand, without reconfiguring your physical network. NSX brings security inside the data center with automated fine-grained policies tied to the virtual machines, while its network virtualization capabilities let you create entire networks in software. This approach securely isolates networks from each other, delivering an inherently better security model for the data center. NSX reduces the time to provision multi-tier networking and security services from weeks to seconds, abstracting virtual networks from the underlying physical network. This lets data center operators achieve faster deployment and greater agility, while providing the flexibility to run on top of any network hardware. NSX provides a platform for bringing the industry’s leading networking and security solutions into the SDDC. By taking advantage of tight integration with the NSX platform, third-party products can not only deploy automatically as needed, but also adapt dynamically to changing conditions in the data center. Network provisioning time reduced from days to seconds. Logical Routing – Routing between logical switches, providing dynamic routing within different virtual networks. Logical Load Balancer – Full featured load balancer with SSL termination.